SEARSPORT — Fiber College of Maine in Searsport is hosting two very special artists this year. Doing free demonstrations and talks, Crispina ffrench and Laverne Waddington are bringing exciting perspectives on recycling and reviving ancient crafts. Once the techniques have been learned, these crafts can be practiced with materials that often are free for the taking. Crispina ffrench of Western Massachusetts is a self-proclaimed ‘Textile Waste Alchemist’ using discarded clothing and textiles to create new clothing and home goods. She began her career while at Massachusetts College of Art and Design in 1987 — long before the term “up-cycling” was coined. She will demonstrate a technique for making “potholder” area rugs using only old T-shirts and other discarded clothing at 2 p.m. Friday, Sept. 7. Potholder Rugs are very large-scale potholders like you might have made as a child. They are amazingly insulating, comfortable to walk and sit on, and are 100 recycled and chemical free. The process is ancient and simple – the finished product is clean, fresh, and useful. As a Fiber College community, we will continue to work on the rug throughout the weekend and go home with the skills to begin our own recycling project. The first community rug will be raffled off to benefit the scholarship fund. Laverne Waddington was born in India, raised in Australia, and now lives in South America. Living there she has embraced and mastered the ancient craft of backstrap weaving. Small, portable and inexpensive — the backstrap loom is ideal for those who lack the space for a table or floor loom, would like to be able to take their weaving “on the road” with them, or simply don’t have the means to invest in more sophisticated equipment. Laverne will be teaching this intriguing ancient art in both an intensive two day class on Sept. 4 and 5, and introductory three-hour classes on Sept. 6 and 7. When she is not teaching Laverne can be found on the porch demonstrating her prowess. Fiber College runs from September 5th through 9th with Wednesday and Thursday dedicated to intensive two-day classes. Friday through Sunday host over 40 classes, free demonstrations, shopper’s Boulevard and $20 drop in session for those who would like to try plasma cutting, 3-D printing, silk painting and spinning. Fiber College is held at Searsport Shores Ocean Campground (216 W. Main St, Searsport) which will be absolutely alive with creativity. 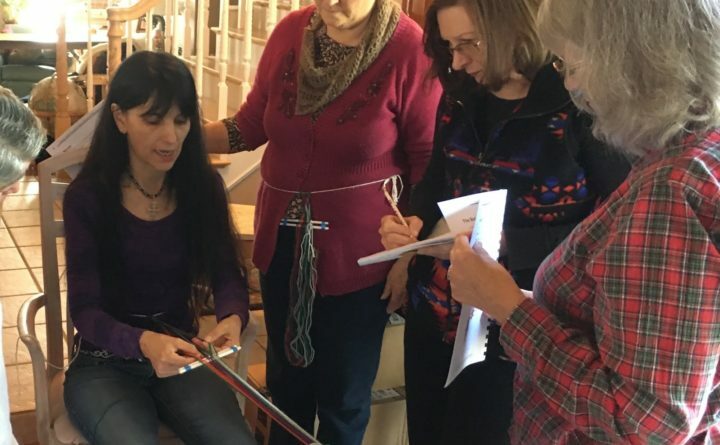 Fiber College is hosted by Makers Guild of Maine, a 501(C)(3) not for profit corporation.